Coconut oil actually has long been used by our ancestors. However, the longer the oil is being abandoned, whereas the function of coconut oil is very diverse, ranging from beauty to health. Lauric acid, the dominant saturated fat in coconut oil is a medium chain fatty acid. The body uses these acids differently than long-chain acids present in fatty foods. Medium chain fatty acids are processed by the liver and converted into energy by the body cells. That's why these fatty acids can help with weight loss. If you are concerned with cholesterol levels, coconut oil consumption can increase good cholesterol (HDL) and bad cholesterol (LDL) in the body. 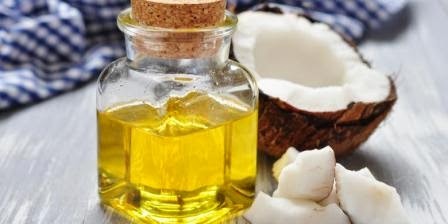 Although both up, the evidence shows that coconut oil to benefit both the unsaturated fats. Coconut oil contains eradicating insects. Although research on this is still minimal, coconut oil was also able to fight viruses, bacteria, or certain fungal infections like the flu, bronchitis, acne, and so on. In addition, virgin coconut oil contains phenolic compounds as antioxidants. Coconut oil is suitable for cooking because the flavor is more delicate and stable when cooked. Many dishes that go well with coconut oil, especially baking and stir-fry dishes that are not too hot. Coconut oil is also popularly used for cooking curry or other dishes that need a tropical scent. Coconut oil is very effective for cleaning makeup. In addition, the oil is suitable for use as a skin moisturizer, especially in cold weather when the skin is dry and cracked. However, due to the high content of lauric acid, should you choose virgin coconut oil (virgin coconut oil) to replace saturated fats such as butter and trans fats. Keep in mind that coconut oil is still fat, and avoid excessive consumption.